Terrorist Financing in West and Central Africa, GIABA, FATF, GABAC. Accueil Rubriques Le choix de WATHI Terrorist Financing in West and Central Africa, GIABA, FATF, GABAC. In recent years, West Africa has been facing terrorist attacks. The recurrence of attacks, such as the ones in Bamako in November 2015 (at the Radisson hotel), in Abidjan in March 2016 (attack in the seaside resort of Grand-Bassam) and in Ouagadougou in January 2016 (attacks at the Splendid hotel and the café-restaurant Cappuccino), have made the region a “fertile breeding ground” for terrorism. Today, the Sahel is considered one of the most dangerous areas in the world and terrorism has become a real security challenge for states and populations. WATHI chose this report, jointly carried out by three specialized organizations, because it focuses on the fragility of West and Central Africa as well as reveals the financing methods of terrorist organizations present in the region. The report, based on government sources, indicates in specific cases that terrorist groups such as the Movement for Unity and Jihad in West Africa (Mujao) have used extortion among local populations. In Nigeria, Boko Haram has carried out acts of robbery, looting and aggression to finance their terrorist activities. Abductions against the payment of ransoms are also on the list of terrorist financing sources (AQIM, Mujao and Boko Haram). The report also refers to other types of funding disclosed by international institutions, researchers and the media, but not always verifiable and confirmed. These activities, considered as potential sources of terrorist financing, range from drug and arms trafficking to trafficking of migrants. Understanding the financing methods of organizations that use terrorism is a major stake in the fight against terrorism. What lessons for the WATHI zone countries? The porosity of borders in West Africa is a determining factor in the mobility of terrorist groups and in the installation and resurgence of violent terrorist attacks. The report sets out a series of recommendations to combat the financing of terrorism. It seems important therefore that the countries of the zone put in place concerted collaborative actions to strengthen border security and control. States should work closely with border communities and the international community as a whole to conduct financial investigations. The hostility of the Sahel zone in terms of climatic conditions favors the presence of terrorist groups and their capacity to develop all kinds of activities to finance their actions. To this end, it would be appropriate to set up mechanisms of solidarity to reinforce the failures of States, which are absent in certain areas of their own territory. In addition to the recommendations mentioned in the report, the countries of the region should make the issue of border control and surveillance a top priority by pooling their defense forces and intelligence systems. 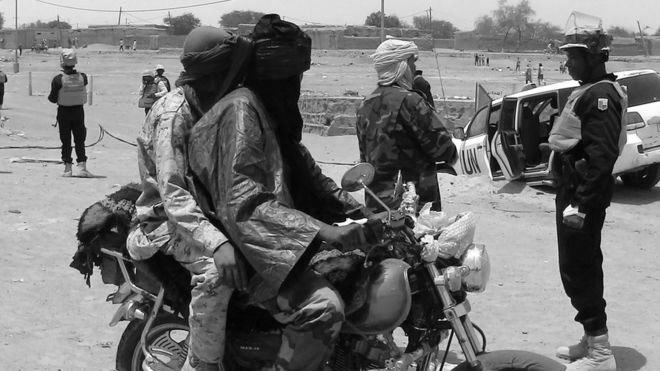 The terrorist group Al Qaeda in the Islamic Maghreb (AQIM) in the Sahel and its dissidents are active in several countries and are taking advantage of the difficulties of states to secure their borders. The importance of informal activities in the region also hinders the control of financial flows. Terrorist groups are taking advantage of the States’ difficulties to control the flow of large sums of money and the transfer of funds used in the financing of terrorism.